The Coen brothers’ Netflix Original movie, “The Ballad of Buster Scruggs,” is a mixed bag of short stories and surprises. Original movies are not known to be Netflix’s strong suite. So after a year of critically panned movies (“The Cloverfield Paradox”) and harmless, but middling rom-coms (“Set It Up”), it was frankly surprising to see the names of two highly respected, Oscar-winning filmmakers plastered across the Netflix home screen. Joel and Ethan Coen, the minds behind classics such as “Fargo” and “The Big Lebowski,” partnered with Netflix to release their latest film, “The Ballad of Buster Scruggs,” a title as head-scratching as its premise. As a Western anthology film, “The Ballad of Buster Scruggs” has every trope from the genre packed into six short vignettes, including saloon shootouts, the Oregon Trail, confrontations with native Americans, and gold hunting. This uncommon short-story format is told through the lens of a storybook labeled “Tales From the American Frontier.” With transitions between stories done through the literal turnings of pages, the movie treats the passage of the on-screen tales as almost innocuous bedtime stories. It’s a tongue-in-cheek stylistic decision, for the tales themselves feature a death count that could rival an action movie. The first story opens with a singing Buster Scruggs (Tim Blake Nelson) atop his horse. His scrawny look, shining white clothes, and carefree demeanor seem out of place against a backdrop of seedy, pistol-wielding criminals who’d rather see him six feet underground. But when the cards are on the table, several unexpected matches between the happy-go-lucky Buster and various disgruntled gunslingers leave only one man standing. Then, almost too abruptly, the next story begins. James Franco plays a different cowboy, with just the right amount of good luck, bad luck, and black humor as Buster. The following stories play out in a similar fashion. It’s no spoiler to say that a death occurs in each story. During the first few stories, I asked, “what was the point of that?” after a character jarringly died — to which the movie seemed to laugh at me and continue on without missing a beat. I’m not typically one to enjoy unnecessary graphic violence, and the clash between the Coens’ nihilism and absurdist humor make for an unsettling watch at times. But, the stories are admittedly compelling when you never know what to expect. As each tale grew less amusingly peculiar and more somber and bleak, I found myself worrying less that the Coens had created a dud like their previous “Suburbicon,” and worrying more about the unknown outcomes of some characters I quickly became invested in. Maybe I’m particular to traditional, emotionally-rewarding arcs, but my favorite story is the second to last vignette, “The Gal Who Got Rattled.” Unlike in the previous stories, death left a hanging cloud of consequences and felt especially unjustified. However, all of the stories echo the same theme. Whether driven by greed or sickness or pride, death is a chaotic and indiscriminate force. The last story drives this message home, as a group of strangers bicker over what the “two types of people in the world” are — to which they are grimly reminded that perhaps the only real difference is if one is alive or dead. The characters’ realization happens over the course of a stagecoach ride that starts with glimmering sunshine and then sinks into an inky black night. It’s a fitting visual comparison to the movie itself, with its comical introduction to Scruggs and its starkly contrasting, ominous ending. As challenging as the anthology format is to execute, most of the stories are consistent in theme yet different in substance. Put and seen altogether, however, the cohesiveness wears thin. While no story’s plot feels too sluggish or rushed to be a major problem, thanks to consistently well-timed delivery of lines and action sequences, the differences in length between stories is apparent while viewing. One or two stories could have even been left out to allow the others to fully develop. Which ones to cut depends on your mileage with the lively and quirky earlier stories or the blunt and brooding later stories, which may seem either too crude or too boring when compared. This tonal inconsistency undermines a movie that already plays hard into its “death-comes-to-all” message with each story. It is a message that, while emotionally effective, is nonetheless thematically weak. 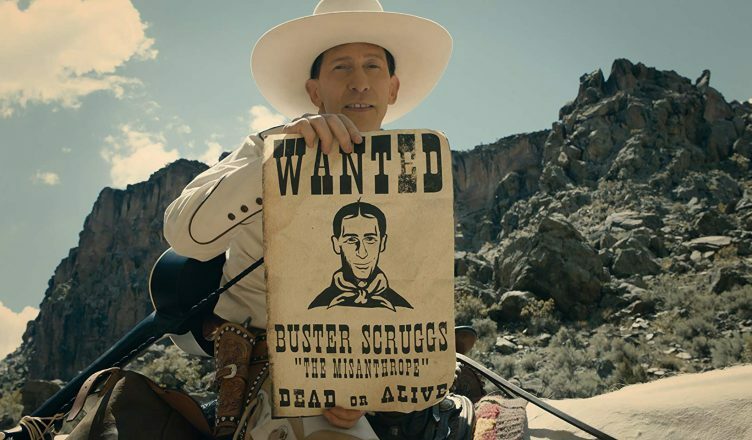 As expected from any Coen brothers movie, the set, clothing, and makeup design departments do a skilled job of replicating the 19th century; the coloring and cinematography is especially rich considering that “The Ballad of Buster Scruggs” is the Coens’ first digitally-shot movie. The actors, too, are talented and well-casted, but there is a lack of non-white characters besides some Native Americans, who do not have speaking roles and are referred to as “savages.” While the movie may be a satirical rendition of old American frontier values, and thus some stereotyping may be expected, the Native Americans are depicted as part of the everyday forces that lead to the deaths of the white characters. The depiction of Native Americans in the film as bringers of violence, while contributing to the film’s morbid theme, also perpetuates cinema’s harmful historical oversimplification of Native Americans. “The Ballad of Buster Scruggs,” while having enough of the Coen brothers’ trademark wit, surprises, and technical skill to keep one entertained, does not manage to break free from its flaws. The unique yet brief stories, interesting yet underdeveloped characters, and clever yet uneven style all create a movie that fails to rise above other Netflix Originals. Ultimately, it falls as one of the brothers’ in-between works. Try rewatching “No Country for Old Men” on Netflix instead. Coen Brothers performed extremely well on this movie. Recently watched it on Netflix. Enjoyed thoroughly. watch all movies & TV shows for free on PC using CotoMovie for Windows. All movies are available in HD quality.